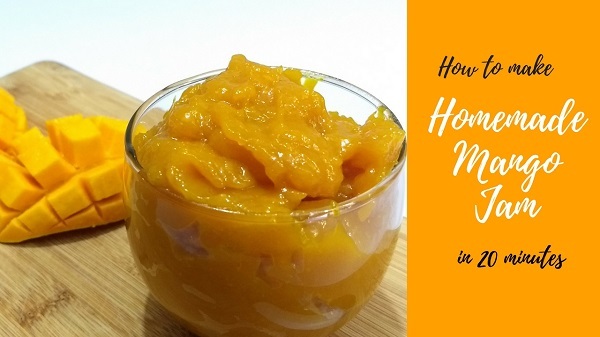 Today I am sharing a recipe for Homemade Mango Jam – A simple & delicious Mango Spread made with just three ingredients and gets ready in just 20 minutes. It has no preservatives, additives or artificial colours or sweeteners. Enjoy this Homemade Mango Jam along with Bread or make a roll using it in Roti/Parathas for your kid’s lunch box. Take a heavy bottom non-stick pan, add Mango Puree. Stir continuously and cook for 7 – 8 minutes over medium flame until it thickens slightly. Lower the flame and add Sugar, mix well. Set flame to medium again and cook for another 5 – 7 minutes, stirring continuously. After 5 minutes, add Lemon Juice, mix well and cook for another 2 minutes. Switch off the flame and stir for another 1 minute and then let it cool down to room temperature. Mango Jam will thicken after cooling to room temperature. Enjoy Mango Jam with Bread or spread it on Roti/Parathas. Store in airtight container in the refrigerator and consume within 15 days.